Many mechanisms of vascular penetrating trauma have been published affecting almost any artery in the human anatomy the most common being false aneurysm formation as a result of stab or gunshot injuries. We have encountered a most unusual form of penetrating trauma involving a “weed wacker” and wish to add this to the literature to increase awareness for emergency physicians and surgeons. A 14-year old boy was standing approximately 15 feet away from his father who was using a weed-wacker to trim his lawn at home. The boy suddenly felt something hit him in the left antecubital fossa, noticed no bruising or bleeding and thought nothing of it. After a 2-week period he observed a swelling in the antecubital fossa which was tender and erythematous. He was referred to the paediatric orthopaedic unit on duty where a diagnosis of cellulitis was made and a week of outpatient oral antibiotic treatment was administered. The swelling and pain increased and he returned to Hospital, where a plain radiograph and CT angiogram revealed a metallic foreign body lodged in the antecubital fossa Fig. (1A ,B ), resulting in a false aneurysm of the brachial artery and absent radial pulse. Radiograph showing metallic foreign body lodged in the brachial artery and, (B) CT angiogram showing brachial artery false aneurysm. Exploration of brachial artery with GoreTex patch and, (B) Metallic foreign body removed from brachial artery. At exploration of the brachial artery an infected false aneurysm was confirmed with a 2mm defect in the vessel wall and the foreign body (a length of rusty metal wire) removed. 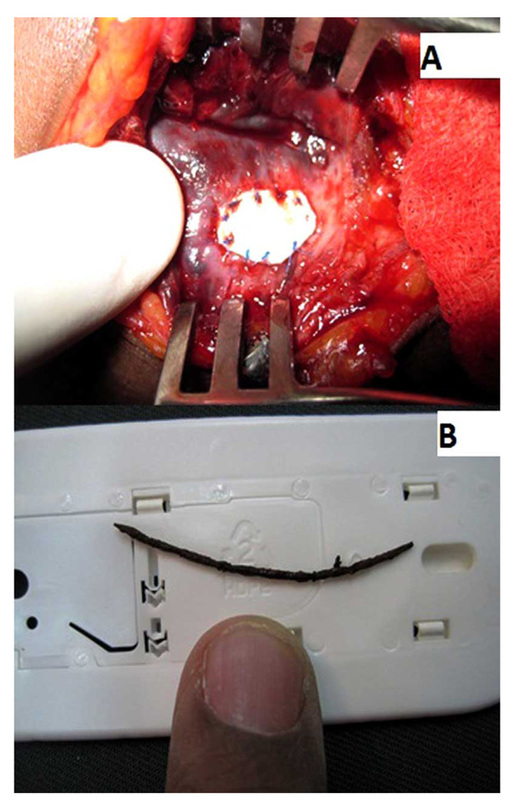 The infected clot was removed and the defect patched with Gore-Tex© (ePTFE) and sutured with 6.0 prolene Fig. (2A ,B ). The patient was kept on intravenous antibiotics for 5 days and discharged. He had an uneventful recovery with excellent pulses at the wrist. A weed-wacker is a novel rotatory mechanical device used quite commonly worldwide for cutting grass and keeping lawns well manicured. This is an unfortunate case of penetrating missile injury from use of a weedwacker, whereby a bystander was hit with a piece of steel wire projected to the antecubital fossa. Interestingly, the patient did not realize that a foreign object had entered since it occurred so quickly, inadvertently and with such high velocity. Additionally, the Orthopaedic team seeing patient assumed this to be a simple case of cellulitis before radiographs and ultrasound investigations were requested. 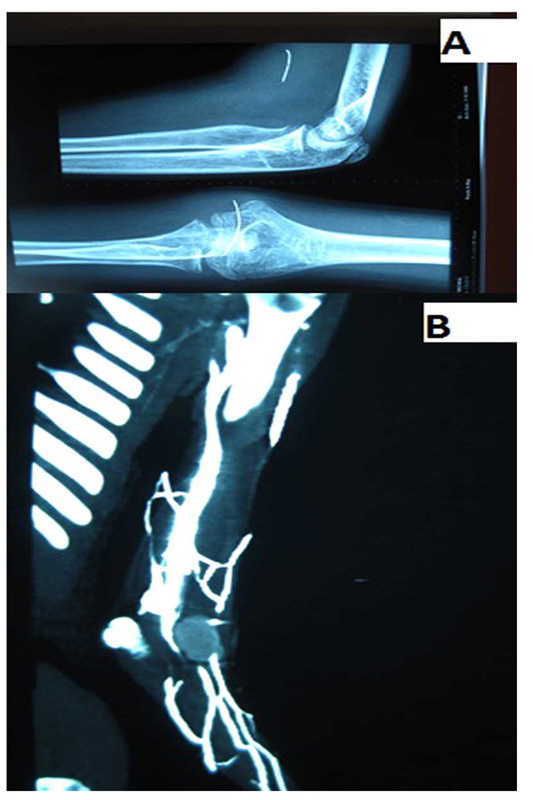 In a literature search on PubMed there are many reported cases of missile embolism from gunshot wounds affecting almost every part of the body with embolisation [1Ntlhe LM, Komati SM, Fourie PA, Rossouw AP. 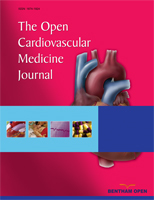 Missile embolism--pulmonary vein to systemic bullet embolism: a case report and review of the literature S Afr J Surg 2008; 46(2): 58-60., 2Meeks T, Nwomeh B, Abdessalam S, Groner J. Paradoxical missile embolus to the right superficial femoral artery following gunshot wound to the liver: a case report J Trauma 2004; 57(6): 338-40.]. There is one case reported with a nail-gun injury to the posterior cerebral artery via the roof of the mouth [3Rezai AR, Lee M, Kite C, Smyth D, Jafar JJ. Traumatic posterior cerebral artery aneurysm secondary to an intracranial nail: case report Surg Neurol 1994; 42(4): 312-5.] and only one report on an ophthalmology website reporting a “weed wacker injury” to the cornea via a similar mechanism as the case in this report [4Sun Y. Case Report: Weedwacker Spoke Embedded in the Cornea Ophthalmology Web [Google Search, Cited 2011 Feb 26] (http://www.ophthalmologyweb.com/FeaturedArticle.aspx?spid=105&aid=417) ]. Two points are made in this article. The first notes the potential danger of use of a weedwacker and its possibility to induce high velocity missile injuries. The second emphasizes safety of use of PTFE in potentially infected fields such as a false aneurysm. The literature endorses this view from several articles published on the topic showing that PTFE maintains its structural integrity in the presence of well-entrenched infection, with a relatively small incidence of anastomotic disruption related to host artery necrosis [5Stone KS, Walshaw R, Sugiyama GT, Dean RE, Dunstan RW. Polytetrafluoroethylene versus autogenous vein grafts for vascular reconstruction in contaminated wounds Am J Surg 1984; 147(5): 692-5.-7White WA, Smego DR, Barone JE. Arterial substitution in lower extremity trauma: autogenous vein vs polytetrafluoroethylene Conn Med 1992; 56(10): 525-8.]. We recommend that in any injury occurring near the site of a working weed-wacker a penetrating missile injury should be considered even if the trauma appears trivial. Appropriate investigations and treatment should be instituted for these cases. Additionally, the issue of safety with use of protective gear and a shield for the weed-wacker is brought to the forefront for this commonly used tool. Ntlhe LM, Komati SM, Fourie PA, Rossouw AP. Missile embolism--pulmonary vein to systemic bullet embolism: a case report and review of the literature S Afr J Surg 2008; 46(2): 58-60. Meeks T, Nwomeh B, Abdessalam S, Groner J. Paradoxical missile embolus to the right superficial femoral artery following gunshot wound to the liver: a case report J Trauma 2004; 57(6): 338-40. Rezai AR, Lee M, Kite C, Smyth D, Jafar JJ. Traumatic posterior cerebral artery aneurysm secondary to an intracranial nail: case report Surg Neurol 1994; 42(4): 312-5. Stone KS, Walshaw R, Sugiyama GT, Dean RE, Dunstan RW. Polytetrafluoroethylene versus autogenous vein grafts for vascular reconstruction in contaminated wounds Am J Surg 1984; 147(5): 692-5. Shah PM, Ito K, Clauss RH, Babu SC, Reynolds BM, Stahl WM. Expanded microporous polytetrafluoroethylene (PTFE) grafts in contaminated wounds: experimental and clinical study J Trauma 1983; 23(12): 1030-3. White WA, Smego DR, Barone JE. Arterial substitution in lower extremity trauma: autogenous vein vs polytetrafluoroethylene Conn Med 1992; 56(10): 525-8.